Pay-per-click (PPC) online advertising is the most effective way to get immediate results from Internet search engines. It also happens to be one of our specialties here at Lakeshore Branding. Our team of AdWords Certified Professionals helps you plan, create, manage, execute and optimize your online ads. 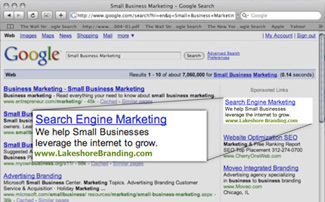 Attuned to the trends of the Web, we can even manage your listings and placements on Google AdWords, Yahoo! Search Marketing, Microsoft adCenter, Facebook, Twitter, LinkedIn, and AdBrite, among other advertising marketplaces. Our goal is simple: drive conversions to your business. From budget planning and creative execution to optimization and demographic targeting, our online advertising management service helps you leverage the Internet to grow your business. Let Lakeshore Branding be your online advertising agency — because more than out-of-the-box creativity, you need in-the-know expertise.